In 1975, Roger Grierson headed to London and Egypt to live but found himself lured back to Sydney in 1976 to work at White Light Records. Soon afterwards, he formed the punk band the Thought Criminals. In 1978, he started Doublethink Records to record local Australian bands including Singles, Rejex, and Suicide Squad. In 1980 he started GREEN Records with Stuart Coupe and Warren Fahey. 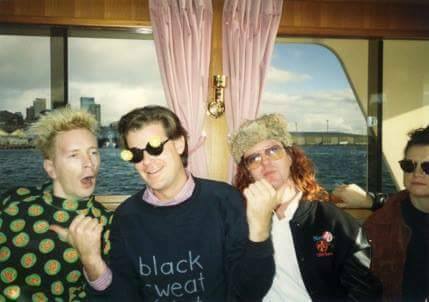 In 1987 he started promoting Australian tours for acts signed to the New Zealand label, Flying Nun Records. These acts include the Bats, the Chills, Straitjacket Fits and JPS Experience. In 1988 he started managing The Go Betweens and Nick Cave and the Bad Seeds. Around this time, he also formed Lost in Music publishing and signed Tex Perkins, Rebecca’s Empire, Caligula, Dave Graney, Clouds, Falling Joys, Crystal Set and Kim Salmon to name a few. In 1992, Rob moved the Lost in Music catalogue to Polygram Music Publishing and became managing director of the now defunct Polygram Music Australia, a position he retained until 1997. During his time at the helm of Polygram Music, he signed Pauly Fuemana, The Cruel Sea, David Hirshfelder, the LennOno catalogue, Leonard Cohen, Died Pretty, Nick Cave & The Bad Seeds, The Fauves and The Go-Betweens In 1998, Rob became chairman of Festival Records and Festival Music publishing. In 2001, he became senior vice President for Newscorp Music. He oversaw the Festival 50th anniversary in 2002. In 2005, he left Festival and retired from the music business. In 2006 Rob reformed the Thought Criminals released an EP Peace Love and Under Surveillance and in 2007 formed the UnTh!nkables with Phillip Judd from Split Enz. In 2010, he became a director of Moshcam, an online streaming live music concert platform. In 2015, Rob began lecturing on music publishing and music industry-related issues at the Australian Institute of Music, while commencing his escorted tours of Oddball Japan, Lobrow Japan, with Rick Tanaka.